People say it all the time, and it's true. Your first draft, it's like a big block of stone. Huge and unwieldy, but full of hidden possibility. The true art of the process comes from chipping away at the stone—the extraneous sentences, the non-essential characters, the navel-gazing tangents—and finding the story. Your story is the sculpture inside the rock. And we've recruited Johnny Shaw to help you find it. He has an MFA in screenwriting and has lectured at Santa Barbara City College and UC Santa Barbara. He's the author of two highly-praised novels. One of which, Dove Season, was lauded by In the Woods author Tana French for "a smart, fluent rhythm and crackle that pull you forward, and it’s full of sharply observed and often very funny details. The author is excellent at creating a sense of place with a few deft strokes..."
Shaw knows how to edit his work down to a fine point--to find that sculpture inside the block of stone—and he'll show you how to do it too, in this four-week course that focuses on the skills necessary for a successful edit. Do you have a manuscript you can't crack? Are you sitting on a screenplay that's ready for another round of edits? Then this workshop is for you. A clear and concise knowledge of traditional three-act story structure, and the ability to create and use that structure to go beyond that tradition. Essential tools for scene construction and pacing, that help to imbue each moment in a scene with conflict and momentum, using clear objectives. Keys to developing characters and writing dialogue that illuminate what the characters aren’t saying, as well as what they are. Finding the thematic strengths of one’s story and getting the most from the themes and getting to the heart of the most important question you face as a writer: Why the story exists. "Johnny Shaw's 'The Next Draft' class was tremendously helpful. Like many writers, I prefer to write. Editing is necessary, but not as fun. 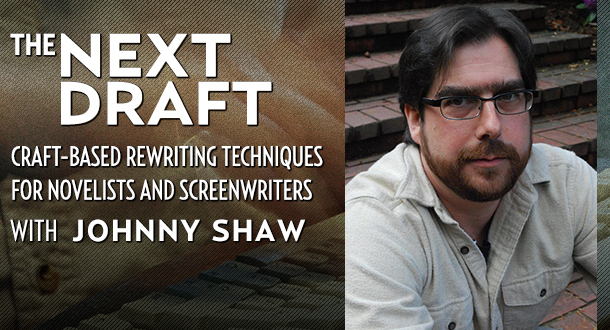 Johnny's a great teacher of the craft of editing, explaining its importance in down-to-earth terms and providing useful techniques and approaches to help writers become good editors. I definitely recommend his class." —Erik A.